Not to be confused with the Welsh actor Michael Forrest. 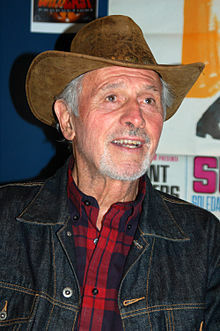 Gerald Michael Charlebois (born April 17, 1929), better known as Michael Forest, is an American actor who provides the voices for many animated titles. At the age of 71, he played the voice of Prince Olympius in Power Rangers Lightspeed Rescue. In his earlier years, Michael was a film and television actor, notably playing the part of Apollo in the 1967 Star Trek episode "Who Mourns for Adonais?" and most recently reprised this role in the Star Trek Continues episode "Pilgrim of Eternity" 47 years later. Born in Harvey, North Dakota, he moved with his family at a very early age to Seattle, Washington. He graduated with a B.A. in English and drama from San Jose State University. The Virginian "S04EP10 airdate 1965 11 24 title Beyond the Border"
^ "Authorized Michael Forest Dealer". ^ "Patlabor: WXIII Ultimate Edition DVD".